Canada's Christopher Mabee was surprised when he won a bronze medal at the Junior Grand Prix Final of Figure Skating. 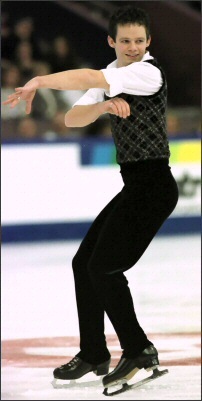 Canada’s Christopher Mabee was surprised when he won a bronze medal at the Junior Grand Prix Final this season. “My goal was just to do well at the Junior Grand Prixs and make the final,” he said. “I was happy just to get there and eighth would have been fine with me. I didn’t expect the podium at all. The short was absolutely insane. Everyone but Griazev skated clean. The long was just as good. The top four all had seven triples. But it was just like in Slovenia. I did two triple Axels and I haven’t missed a triple Axel all season.” Mabee won the JGP Skate Bled in Slovenia and took third at Skate Slovakia. “I listen to the widest range of music of anyone I’ve talked to,” he continued, “everything from classical to country music. But I don’t do too much off ice. I go to movies but I usually like to do things that are laid back, that get my mind off of skating. I’ve been skiing a bit, two or three times a year and I have a lot of fun doing that. I also keep my stuffed animals. I like to look back and remember where I got them. And we have a little dog at home, a Shih Tzu named Vader. A mean name for a little dog.” Mabee also uses his computer a lot to keep in contact with friends he’s met through skating. “I scan photos from the competitions too,” he said. “I take a lot of photos off ice. When I went to China with my sister, we filled a whole scrapbook.” Mabee enjoys travel. “I liked Slovenia and Malmo best,” he said. “I met so many nice people and learned so much about my skating there.” He’d like to visit Australia and Russia. A fundraising group named Youth and Dreams holds a dance and silent auction each spring. Most of the funds raised from this event are forwarded to Skate Canada in trust for Mabee, while a portion of the proceeds is donated to a charity group such as Ronald McDonald House or Camp Trillium. “It is important to give back to the community,” Mabee said.